Tinyprints.com is the largest supplier of custom invitations. They have really cute free cards you can send online too. Their “Studios Basics” collection has 137 different, really cute, fresh and unique baby shower designs starting at: $0.59-$0.89 each. You personalize your cards online, and they take care of the rest. Your cards will be printed, enveloped addressed and mailed for you; talk about convenience. They also run weekly promotions and discounts that might save you a little cash too. Minted.com is another, highly rated site for gorgeous invites. They’re the perfect solution when, you need superb quality, and luxurious designs. PurpleTrail:﻿ You can fully customize any of their cards online. 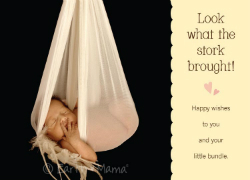 Again, everything from, shower invitations, thank you cards and birth announcements is just beautiful. They have cards for gender reveal parties, co-ed showers, second showers, and adoption showers too. This is a breakdown on what they say about their company, and services. I also noticed an option for overnight shipping, but there is an extra charge for that. It appears, the card stock (invitation paper) they use is high quality-even on discount cards. Their prices are generally 20%-30% below other custom card services. 3.5″ x 5″ Folded Cards: $1.22 ea. 5.25″ x 5.25″ Circle Cards: $1.85 ea. 4″ x 5.5″ Trifold Cards: $2.52 ea. On top of their discounted prices, they are offering new customers, 15% off-you will need to use a code when you check out (you can find it on the purple trail website). Be sure to go to the menu at the bottom of their screen, click on: cheap invitations to see even more discounts. I think you will find all their entire baby shower collection- really, really cute too! Scrapbook.com has e-cut cards for $0.99. 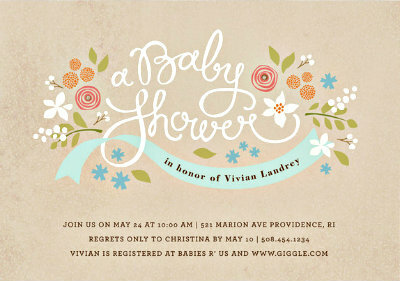 Print as many baby shower invitations as you want. These guys also have cute embellishments for a homemade look! 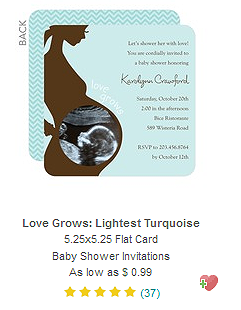 Printable baby shower invitations are all over the intranet. Sometimes, it’s a really great, affordable option. However, sometimes it’s not. Supplies like, card stock, envelopes, and ink can cost a small fortune; unless you know what you’re doing (speaking from personal experience, of course)! Funsational.com has always been know for their printable baby shower games; now they have baby shower packs that include the invitations. The download for is less than $10, the invitations by themselves are less than $5. Big Box stores, usually have a $1 section with, decorative and blank cards. 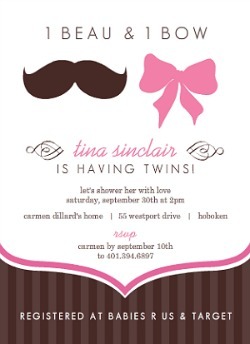 You can get creative and make your own invitations for the shower too. It’s not a big time saver, but it can be a money-saver! It will make your life much easier if you’re prepared with some back up (again, speaking from personal experience)! Boy baby shower invitation ideas: Blue Heart Invitation click to download the PDF.